With only 7 weeks to go until Christmas 2013, the temperature has dropped and frosty mornings are becoming increasingly more apparent, December is nearly upon and it’s time for the celebrations to begin! The start of November is a good bench march to start thinking about what gifts and presents to give to your family and friends this Christmas. Here at Wineware, we’ve compiled a list of some early wine related Christmas presents that will really go down well with the wine enthusiast in your life. The Ivento range from Schott Zwiesel is one of their most popular, they’re ideal for using at home over dinner or simply enjoying in front of the TV. 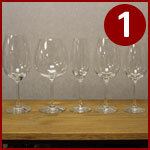 The timeless and functional designed range features 5 glasses (Bordeaux, Burgundy, Red, White and Champagne), so they’re great for a wine beginner or an avid enthusiast. Made from Schott Zwiesel’s very own Tritan Crystal means the glasses remain sparklingly brilliant, dishwasher safe and highly resistant to breakage. Why buy? Great value you for money. Click here to view more. This is one of our most popular and best-selling Wine Aerators we offer. Everyone knows that aerating and letting red wine breathe improves the overall taste and ‘wine experience’. This aerator is easy to use, grab your glasses or decanter, and simply pour your wine into the top and watch the wine filter through the small holes at the bottom of the aerator! 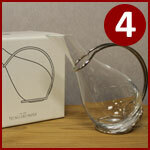 The wine then hits the side walls (neck) of your decanter maximising the oxygenation process! Why buy? Easy to use and aerates your wine. Good stocking filler. Click here to view more. 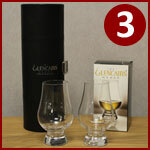 If you’re looking for the ultimate Whisky gift this Christmas, then look no further than the Glencairn Whisky glass. The glass has a simple design which has undergone years of development and testing, but it’s now recognised globally as ‘the glass for whisky’. We provide this glass in variety of different sets and packaging, so whether it’s presented in a gift box or included with a smart water jug, we’re sure our range of Glencairn whisky glasses will put a big smile on Dad’s face this Christmas! Why buy? The must have glass for Whisky, used Worldwide by master blenders and connoisseurs. Click here to view more. Decanting red wine within the Tecno Decanter ensures that the wine is exposed to a wide surface area, perfect for aeration. The semi-reclined shape of this wine decanter ensures there’s minimal disturbance of the wine when it’s poured into the glass. It’s manufactured in glass and a nickel plated pouring handle making it easy to use. A great gift for either Mum or Dad as it’ll add a touch of class to any dinner table. Why buy? A unique and different Wine Decanter which is easy to use and pour. Click here to view more. The WineSkin bottle protectors will protect your wine (and other glass bottles) when you place them in your suitcase or luggage. These great little bags are the perfect solution when you bring home bottles of wine from your holiday. If the unfortunate did happen and the bottle was to break in your suitcase, the WineSkin prevents any liquid or glass escaping and coming into contact with the rest of the contents within your bag. Why buy? A cost-effective essential if you bring back wine from a Holiday in your luggage. Click here to view more. The Vinrack wine racks are great if you’re limited on space and you don’t have a large selection, just a few bottles of wine you drink with dinner. They’re incredibly easy to put together as the rack simply slots together, you don’t need any tools or screws, nothing! 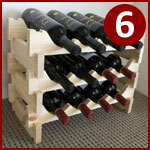 Available in 3 different sizes (12, 18, 48 bottles) and in 2 different colours, natural pine or a dark stain. Why buy? Easy to put together, should have it in place before Christmas dinner! Click here to view more. 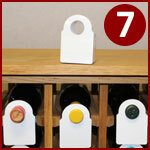 If you’re other half is an avid wine collector, then wine bottle neck tags are vital! Identifying your wines within your rack is made easy with bottle neck tags; it means you don’t have to disturb the wine if you’re trying to find a certain bottle or vintage, they make it easy to navigate and detect which wine is which. Why buy? An easy way to identify your wines stored within a wine rack. Click here to view more. Keeping your wine decanter and glasses clean and in good condition is vital. Not only is this so you can enjoy your wine to its fullest, it also prevents you having to purchase additional glassware due to poor up keep. 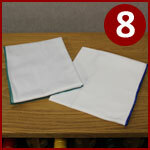 Our lint free glass cloths are great at making your glassware shine time and time again. Why buy? 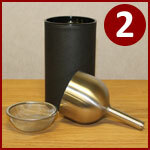 A cost effective stocking filling and a great way to keep your glassware sparkling clean. Click here to view more. Keeping your bottle of white wine cool once it’s left the fridge is vital to enjoying it to its fullest potential. Our range of cost effective VacuVin cooler sleeves will keep your wine chilled for hours, giving you plenty of time to finish off the bottle! These different designed ‘rapid ice cooler sleeves’ are easy to use, simply place the sleeve in your freezer until it’s cold, withdraw and wrap it around your bottle of wine, it’ll chill within 5 minutes! Why buy? 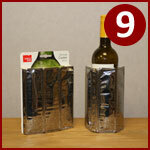 A great stocking filling and an essential wine accessory for any wine enthusiast. Click here to view more. Storing high-end and expensive wine in the correct storage conditions and temperatures is vital for not only the quality of the wine, but the value it possesses. 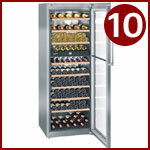 Liebherr Wine Cabinets provide excellent conditions for your wine, in a variety of different sized wine cabinets as well as different performance styles too, depending on what type of wine it is your storing and for how long, whether it’s for a short period of time or a long period of time. Why buy? Expensive wine should be stored in the correct temperatures and Liebherr Wine Cabinets provide that in exceptional detail. Click here to view more. Alternatively, why not let your friends and family decide which wine accessories they’d like, with a Wineware Gift Voucher?